It's like Christmas has come to the Bongga household! 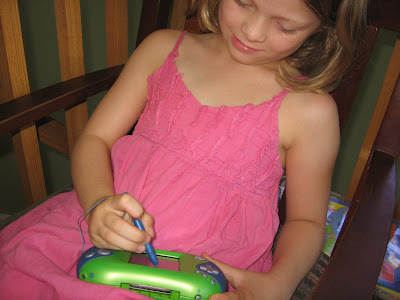 We recently received a bunch of LeapFrog products to try out: the TAG, Leapster2 and Didj (how convenient, one for each kid so they don't claw and bite each other's eyes out). We're going to play with them, learn with them, and basically rip them apart to let you know what we think of them. Will they be able to withstand the grabbing, dropping, not to mention dirty fingers and crayons lurking throughout the house? Will they be able to engage my kids (whose attention spans rank somewhere between flea and guinea pig) beyond the 2-week honeymoon phase? And most important, will their educational value be enough to overcome our distate for video games? Stay tuned for the answers! 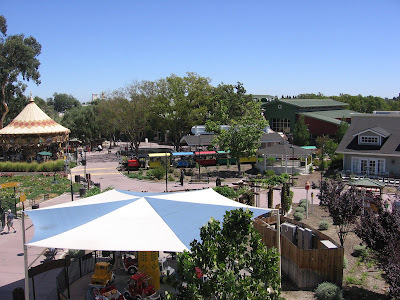 Yesterday I took the kids out for one final summer outing to the Nut Tree Theme Park, a charming little theme park in the middle of the Nut Tree Village, a shopping a restaurant complex in Vacaville, CA. The park is small and low-key with no waiting lines to speak of, so we had a great stress-free afternoon. Despite the burning hundred-degree heat, we kept our cool with the help of some sunblock, hats and ice-cold water, not to mention the park's thoughtfully-placed shade canopies and misting sprays (and did I mention no waiting lines, so we didn't have to stand in the sun?). The rides, geared for kids ages 2 through 8, are small and simple, guaranteed not to whip the kids up into a frenzy. 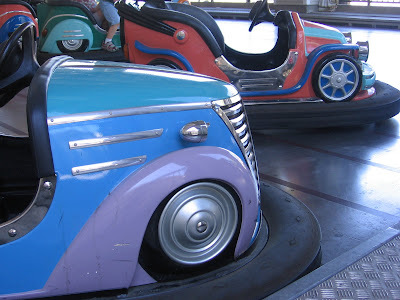 My kids (ages 4, 4 and 7) understandably preferred the "big kid" rides: the bumper cards, the spinning balloon ride and their favorite, the roller coaster, but are still young enough to enjoy "the rides that go round and round": the carousel, plane, car and train rides. My favorite was the carousel, mainly because I love the brightly-colored animals (And by the way, did you know the difference between a carousel and a merry-go-round? According to one of the park employees, a merry-go-round has only horses on it, while carousels have different types of animals). 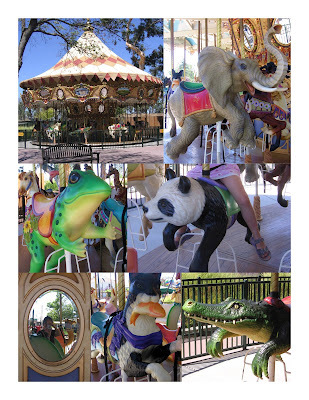 This particular carousel had some intruiging animals on it that I've never seen before, including a panda, a frog and a crocodile. Individual ride tickets work out to be quite expensive ($1.40 to $3.40 per ride, and height restrictions for "big kid" rides mean that most 4-year olds still need an adult to ride with them), so if you're planning to spend more than 30 minutes in the park, your best bet is to buy an unlimited ride wristband for $10. For added savings, here's a coupon code you can use to receive $3 off each wristband when you buy them online! 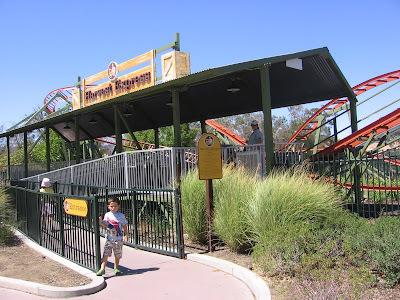 Just go to Nut Tree's online ticket sales and buy online from the Nut Tree Theme Park website, select the number of wristbands (they're called Fun Passports) you want and enter the Promotion Code BLOG08 to receive $3 off each one. And here's an even better deal: I'm giving away some Fun Passports to the Nut Tree Theme Park so you can take your kids to the park for free! To enter, just leave a comment on this post before September 30 (and be sure to include your email address so I can contact you). On October 1, I'll randomly select ten lucky winners, who will each receive 4 unlimited ride wristbands (Read the full contest rules here). Good luck! This Full House is hosting a great week-long Back to School giveaway. There are some seriously great prizes to be won from August 25 through September 1. ChefDruck is hosting a Handy Manny DVD giveaway. Entries are accepted till September 1. Mod*mom is hosting a Whole Foods back-to-school giveaway. Entries are accepted till September 1. Now Entering Momville is hosting a Jack and Lily baby shoes giveaway. Entries are accepted till August 26. There are just three days left to win prizes over at Goodies for Mom during their Blogging for Blood event. It's such a wonderful way to spread awareness of the importance of cancer research via the blogosphere -- and you have a chance to win some fabulous prizes at the same time. In addition, the Friends of Heroes are giving away more great prizes on their blog until August 18. Drop by every day and comment for a chance to win! Only 1 week left for our England vacation and already I'm thinking about the upcoming schoolyear. After we get back to Palo Alto, I've got less than a week to make sure the kids have all the necessary clothes, books, supplies and gear. Fortunately, Land's End has everything we need. The full-price Land's End stuff costs a lot more compared to Target, but they last oh-so-much longer -- and they always have sales, and there's the Land's End outlet! All in all, they're one of my favorite retailers. Here's another blogger who agrees with me. Kim from Hormone-Colored Days is giving away a Land's End backpack filled with goodies to one lucky reader. Head on over to join her contest! "Can I use the computer???" "How come you're always on the computer? I want a turn!!" To enter, just leave a comment with your email address or blog (By the way, please read the complete contest rules here). I'll draw 2 random winners from all the entries on August 15. Good luck!